To access the nearest basic health center, villagers in Ambatoharanana, a remote community in northeastern Madagascar, must walk more than six miles to Beforona—over terrain that is too difficult to traverse by car. To reach the nearest regional referral hospital in Moramanga, they must travel nearly 40 more miles. This was the journey that pregnant 16-year-old Rasoloharisoa Jeanna Perette would need to make in order to receive lifesaving care. For her prenatal consultations, Perette had visited a midwife at the health center in Beforona. She had planned to give birth at home aided by her family and a matron, a traditional birth attendant. But during her pregnancy, Perette began to feel sick, experiencing a persistent headache and fever. When Perette’s symptoms persisted, her family alerted Beniaina Richard, a community health worker living in Ambatoharanana. Richard had been trained in maternal and neonatal health care by the U. S. Agency for International Development’s flagship Maternal and Child Health Integrated Program (MCHIP), which is led by Jhpiego. After evaluating Perette, Richard suspected pre-eclampsia/eclampsia, a potentially life-threatening hypertensive disorder related to pregnancy. He advised her family that she was dangerously ill and needed to get to a hospital as soon as possible. Using the skills and knowledge he gained through the MCHIP program, Richard organized an emergency plan to transport Perette to a health facility—not once, but twice. This plan enabled Perette to reach the hospital in time to receive care that would save two lives—her own life and the life of the baby she would eventually deliver. Richard’s timely response and exemplary work within this tiny community illustrate MCHIP’s focus. MCHIP’s goal is to ensure that women and families in communities receive the care they need, when and where they need it, locally or at a higher-level facility. MCHIP recognizes that more women and children will have improved health outcomes if they have high-quality health care services. MCHIP has worked in more than 50 countries to expand access to care, scale up effective interventions, and—where it makes sense—provide integrated services from the community to the facility level. 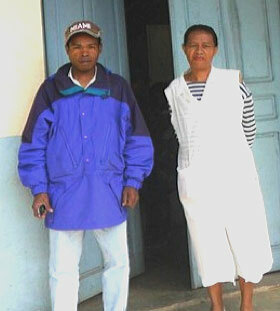 Richard was among 756 community health workers in five districts of Madagascar who, in May 2013, received MCHIP-sponsored training in maternal, newborn and child health care. During this training, Richard learned infection prevention measures, including proper handwashing, as well as basic maternal and newborn health care procedures. He learned to recognize danger signs in pregnancy, labor and delivery, including complications such as pre-eclampsia/eclampsia and postpartum hemorrhage. This training prepared Richard and other health care workers to meet with and educate pregnant women in their communities. Following training, health care workers like Richard were able to teach women and their families how to develop a birth plan, prepare for emergency transport, take measures to respond to complications, care for a newborn and appreciate the importance of exclusive breastfeeding. Although Richard’s grasp of these issues was excellent, it was his emotional support and encouragement that helped persuade Perette’s family to overcome their fears and make the difficult journey beyond their home village to a facility that could provide the emergency care she needed. With Perette’s husband away looking for work, her family felt that staying in the village and being treated by a midwife was all they could afford. Richard convinced them that traveling to the nearest health center was urgent, and he helped organize Perette’s transport. While Richard telephoned the facility to advise the staff of Perette’s dangerous fever and impending arrival, the family tied pieces of cloth to a stick to create a filanjana in which Perette could be carried. The convoy then left Ambatoharanana and embarked on a 21-hour walk in light rain to Beforona. 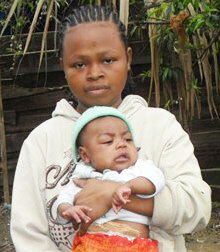 When the group arrived in Beforona, a midwife began to care for Perette. But despite these efforts, Perette’s health continued to decline. When Perette began having seizures, the midwife advised the family to move the mother again—this time to the referral hospital in Moramanga. For the second time that night, Richard helped the family organize transport, asking around until he was able to locate a rental car, and alerting the referral hospital that a pregnant woman was on her way. Upon Perette’s arrival, the Moramanga staff were ready to administer immediate care. Fortunately, the treatments worked quickly: Perette’s temperature returned to normal and her seizures disappeared. By the next morning, she had given birth to a baby girl named Hary. Now, several months later, mother and baby continue to be in good health.